I loosely remember the first time I saw Van Go - perhaps it was in a magazine, or maybe online - the details are fuzzy, but unimportant. What I do remember was a sense of curiosity. 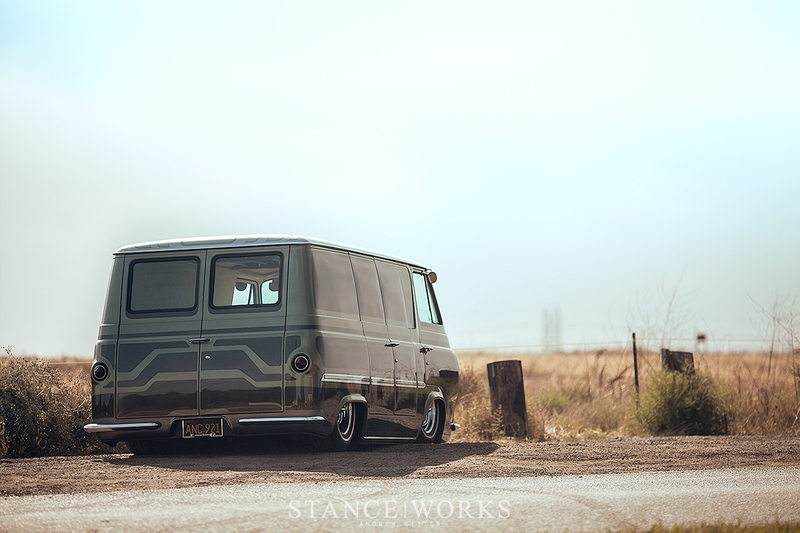 To be honest, I wasn’t quite sure what I was looking at; I knew, quite obviously, that it was a beyond-custom Ford Econoline van, but I couldn’t tell when it had been built. Was I looking at a modern homage to one of the most important eras of automotive customization? Or was this a museum piece, fit to be parked along side the greats, such as Ed Roth’s “Beatnik Bandit?” In retrospect, that's precisely what Coby Gewertz had hoped for. Even having to ask that question made something clear: Van Go is something special. As car enthusiasts, there are a handful of cars that, chances are, we’re all familiar with. They’d be an integral part of the Automotive Bible, if there were one. Cars like Ala Kart, the Dodge Deora, Cadzilla, and even the Gypsy Rose all hold a special place in automotive history. What makes these cars so special is often hard to define; they are far greater than the sum of their parts. But, as famous Supreme Court Justice Potter Stewart put it, “I know it when I see it.” And when I saw Van Go, it was immediately clear that it’s one of those. It’s impossible to deny that Van Go is truly one-of-a-kind, and if I had my guess, it’ll be remembered for decades to come. 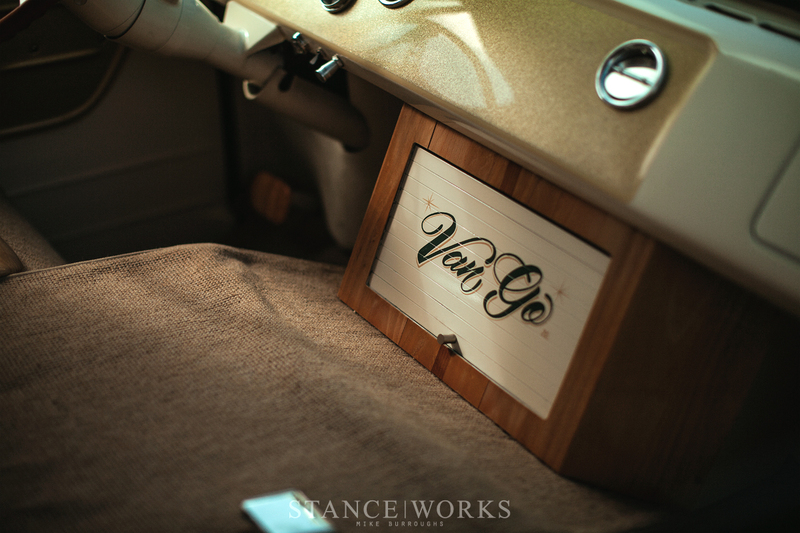 If such a qualifier makes it unclear, Van Go isn’t from the golden era of kustom cars. In fact, owner Coby Gewertz finished the build just a handful of years ago, and ever since, he’s been behind the wheel, cruising the west coast. From within Van Go, he sells his design work and promotes his brand and magazine, Church - For Cars, Not Culture. That means, of course, that Van Go was built with a purpose; it’s not merely a show vehicle, but perhaps the end-all when it comes to mobile merchandising. Coby is an artist, in both the automotive and the literal sense. His brand is an amalgam of the two, and Van Go is his magnum opus. 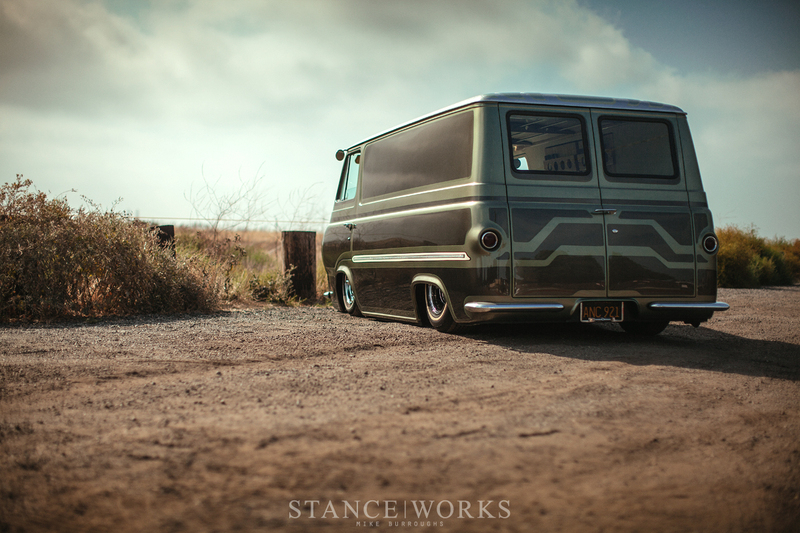 It wasn’t intent, but rather happenstance, that lead to Coby’s acquisition of the 1963 Ford Econoline. After drumming up ideas about building a useful but stylish utility vehicle, his friend Mike Gerry offered this particular truck to him, and for the best price of all: free. It wasn’t love at first sight either… it took time before the lines of the classic Ford reared their potential. Once motivated, Coby began working towards an aesthetic that made the details of the Econoline stand out. Working with many of the same design cues as, say, a loaf of bread, Coby set out to plant the van firmly on the ground: the first objective on the growing list of custom touches for the lump of steel. 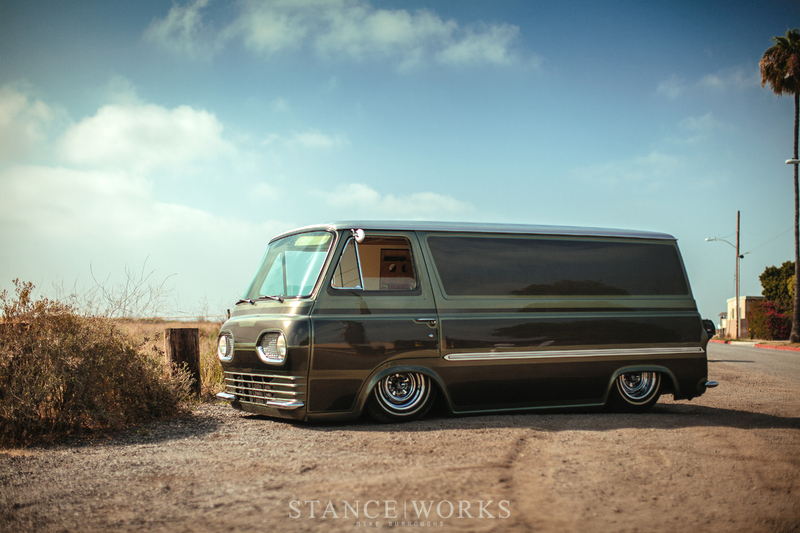 KA Custom in Huntingon Beach, CA received the van and the orders, and within no time, a custom chassis was built. Mustang II front suspension components were used for their simplicity and to help eliminate the bump steer prevalent in slammed beam-axle front ends, and mated just behind the front clip is a tried and true Chevy 350 small block. Unfazed by the criticisms of using a Chevy motor underneath Ford steel, Coby touts its reliability, power, and of course, its cost-effective nature as the reasoning behind it… although, “cost effective” was likely the last reason for any other part of the Van Go build. Perhaps the toughest part of the chassis build was the steering system, which required a custom chain-driven steering gearbox to both fit and work properly in the limited cab space. 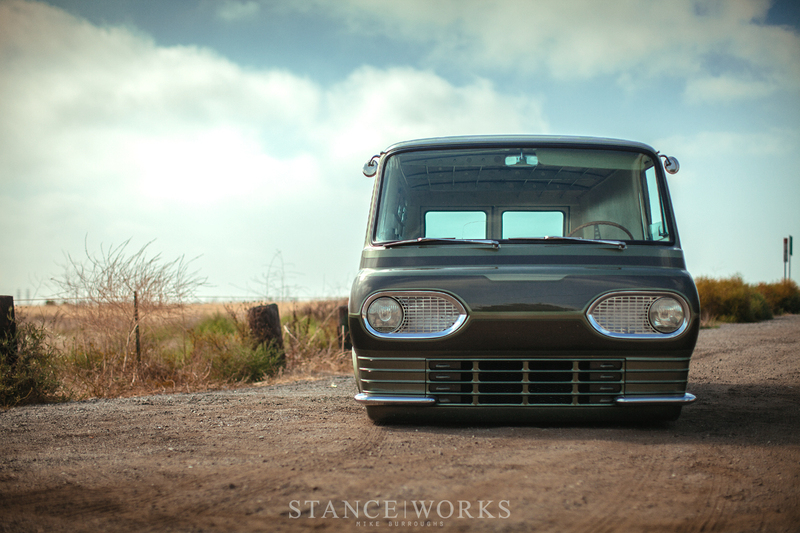 While most vehicles have an engine bay to house bulky components, the Econoline’s flat face and forward seating position meant that Kevin and Steve from KA Custom had their work cut out for them, hiding everything to yield an uninterrupted finished product. The wheel wells were raised too, further cutting into the driver’s cabin space. Lowering the truck by such a significant amount meant the wheels and suspension components needed a substantial increase and room. The rear end is a similar story; while the solid rear axle makes things a bit easier to build, the rear of the cabin is consumed by the space required for all of the suspension components, as well as the fuel cell. With the truck’s chassis, suspension, and driveline work done, it was time for the real work to begin. 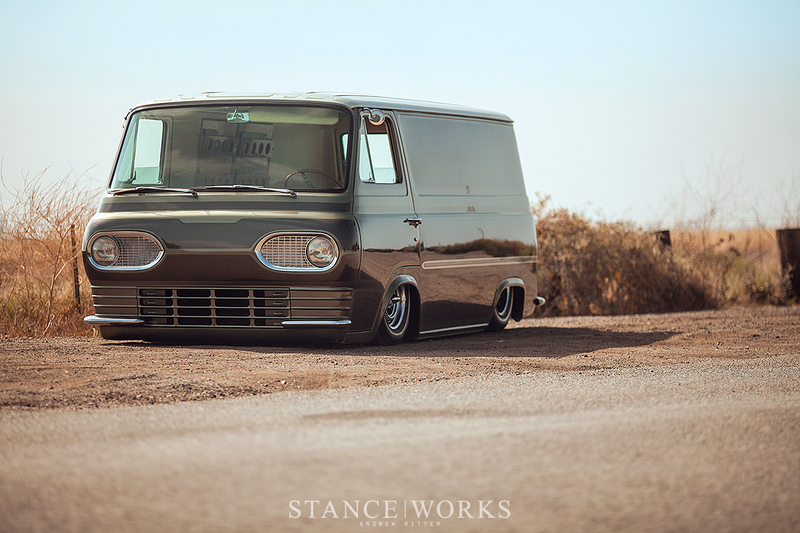 While most of us would be happy with a laid-out cargo van from the 1960s, Coby aimed to build a truck for the ages, and thus enlisted the help of Tim Conder for metalwork, bodywork, paint, and design. Together, the two set out on a path, guided and refined by one another, and eventually, Van Go took shape. Tim Conder was entirely unconvinced of Coby’s choice in Green Tea Metallic as a base color, but after significant back-and-forth between the duo, Tim penned out the ultimate Larry-Watson inspired paneled paint job. Asymmetric from one side to the other, Van Go’s line and panel work are unique and world class, and accentuate the Econoline’s lack of doors on one side. 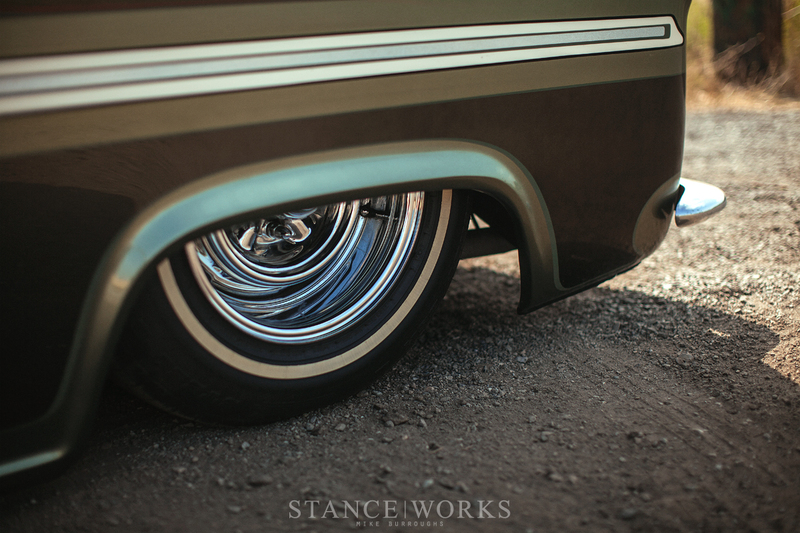 A vibrant metallic shimmer sinks deep into every panel, and the roof’s design work alone leaves nothing to be desired, straddling the line between hotrodding, lowriders, and Kustom builds from the ‘60s. 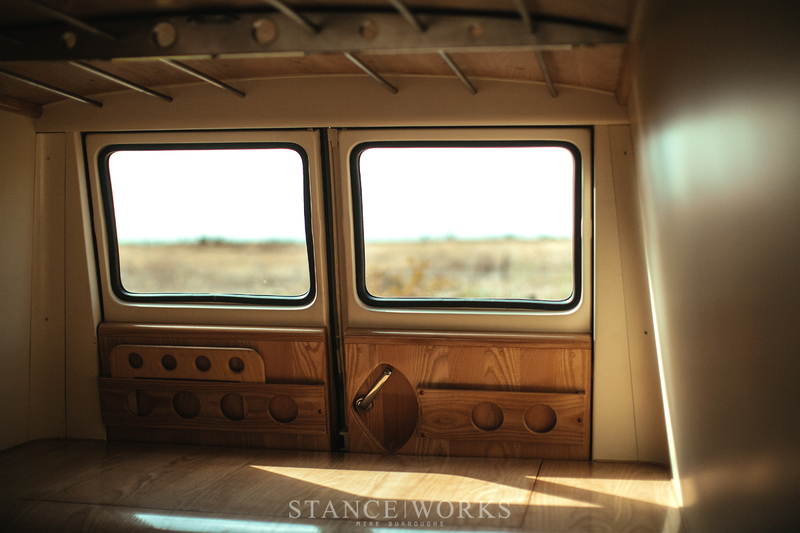 For the inside of the truck, master woodworker Pablo Perez was brought in to shape the interior and cater to Coby’s vision of an Eames-inspired midcentury-modern cabin. 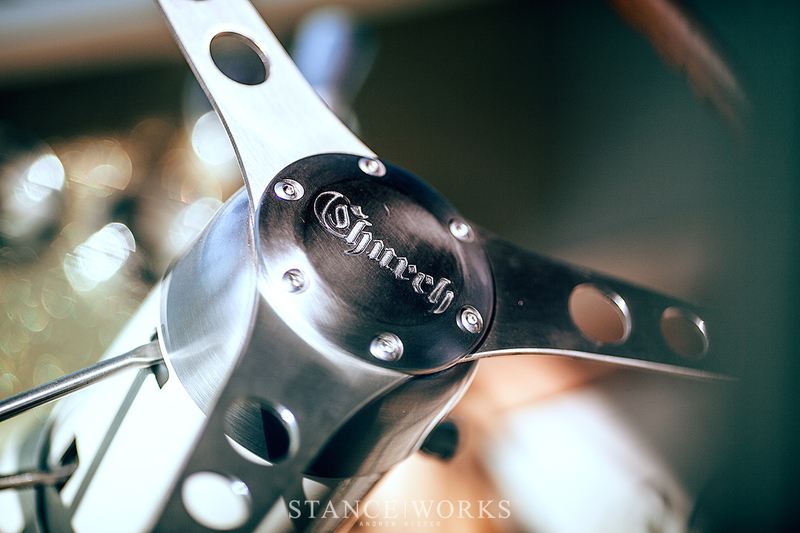 Everything serves a purpose, from the stainless steel roof ribbing that supports t-shirts at the swap meet, to the door-mounted shelving that holds is copies of the wonderful Church magazine. 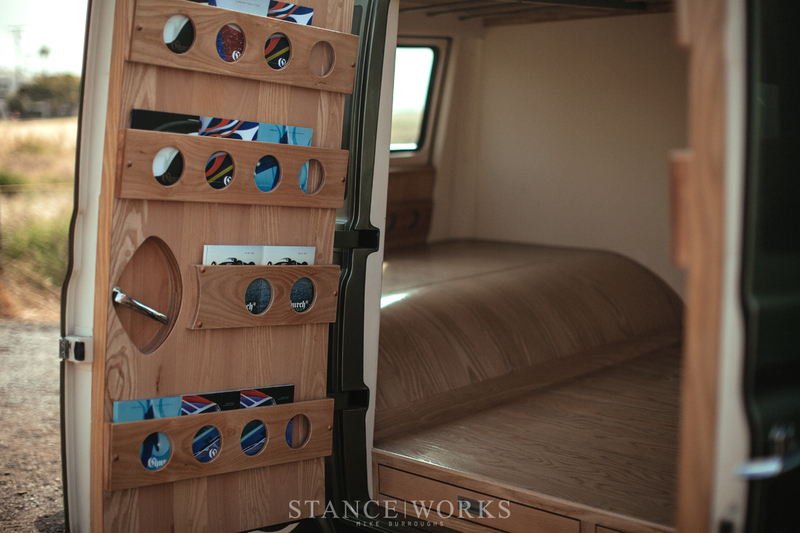 Custom pull-out drawers hold art prints and more, and everything is sculpted beautifully, even the Eames “Potato Chip” style seats at the front. The engine is housed under a custom cover, and even the floor itself flows from front to rear, without a right angle to be found. The details of Van Go are endless. It’d be easy to write thousands, if not ten thousand words about the touches, the character, and the simple uniqueness that makes Van Go one of a kind. Where I fall short of storytelling, I hope photos make up. In all, however, Van Go is one you’ll need to see in person, and if you want my guess, I think, maybe someday, you’ll get the chance to. While I can only imagine that someday, Van Go will spend its time in a museum with the all-time greats, you may just catch Coby and his creation out and about. He’s a car guy, just like you and I, and he won’t be parking his van any time soon. Always great to see more on this incredible build. 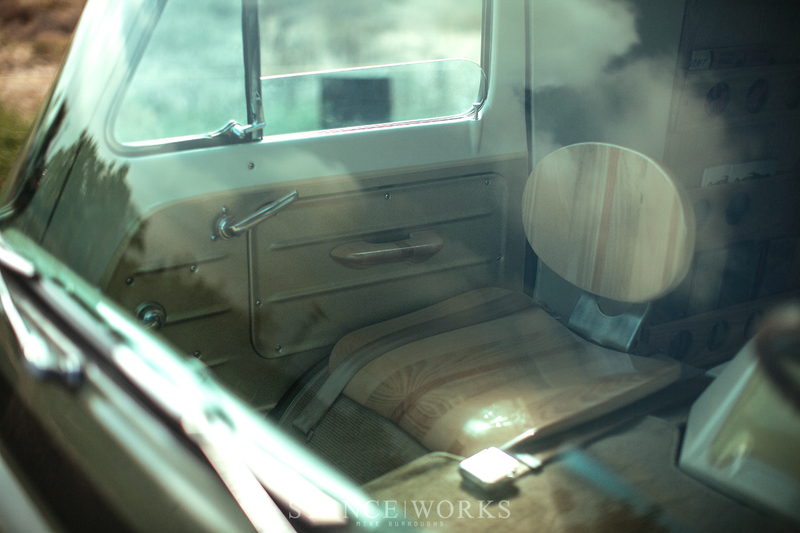 I’m really glad you picked up on the Eames-like design of the interior. I was thinking it the whole time I was reading and looking at the pictures. 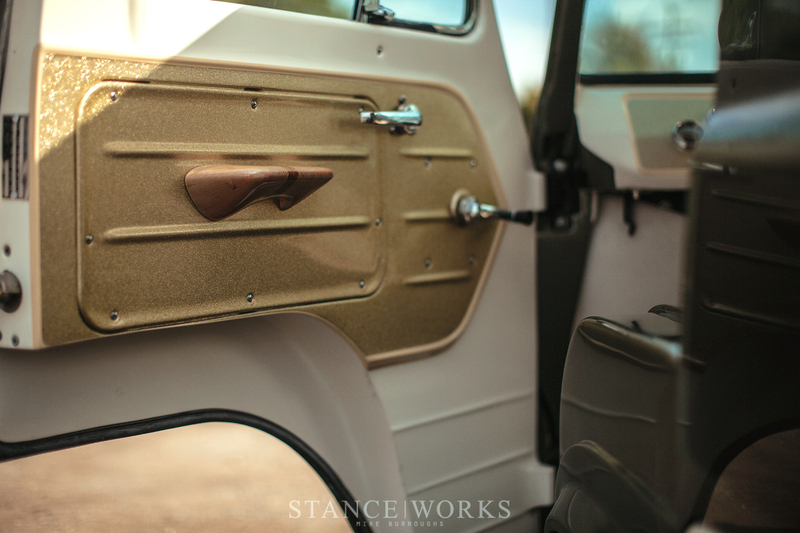 It’s so simple and elegant with the use of wood in the seat backs and paneling. I love it.